Find hotel near Beijing Temple Of Confuci ..
Temple of Confucius in Beijing is located on the Guozijian Street and inside the Anding Gate. The temple is one of the most picturesque and prominent ones in the destination and sees a lot of tourism all year round. 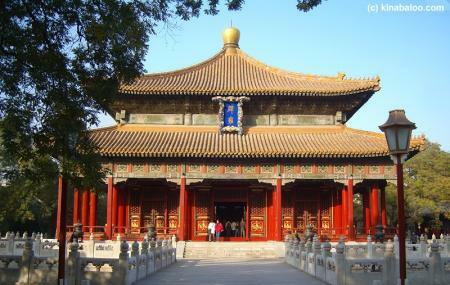 It is also the place where people in the destination paid homage to Confucius, during the Yuan Dynasty (1271-1368). Initially built in 1302 the temple gained popularity due to its iconic architecture and design. May to October: Ticket sales ends at 17:30. November to April: Ticket sales ends at 16:30. Take a bus from Yonghegong Lama Temple. Take the subway from Yonghegong Lama Temple. You can take a rental or taxi to the location. Love this? Explore the entire list of places to visit in Beijing before you plan your trip. Fancy a good night's sleep after a tiring day? Check out where to stay in Beijing and book an accommodation of your choice. How popular is Beijing Temple Of Confucius? People normally club together Lama Temple and National Stadium while planning their visit to Beijing Temple Of Confucius.